In our previous article, we explained our classification and categorization of the AI vendor landscape. With almost 3000 vendors to classify in ways that were useful this was no small feat. If you haven’t read that article yet, you should do so now before continuing, because this article builds up on that work. In the previous article linked above, we mentioned that over half of the vendors that we’re researching and profiling have industry or domain-specific applications of AI. This means their solutions are not meant to enable you to build other solutions on top of their offerings, nor do they provide general AI and ML infrastructure or horizontal solutions applicable to a wide range of industry or domain applications. It should therefore be no surprise that this top layer of the AI Vendor Classification is extremely diverse, with dozens of further categories and distinctions. 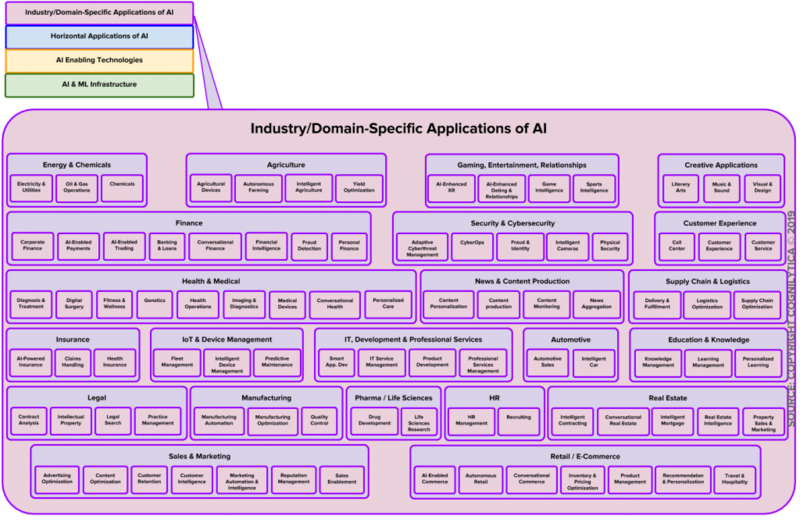 While our classification in this layer is not meant to be comprehensive — it would be impossible to truly identify every domain-specific application of AI — the vendors and industries classified here cover a wide range of application types, represent some of the best funded AI vendors in the industry, and represent a wide range of use cases for AI that are applicable to other industries. Keep in mind this classification is not meant to identify every application of AI, but rather, to help sort out the vendors that are offering solutions and products in the market. As such, there’s no doubt innumerably more applications developed by enterprises for their own usages or custom solutions built by consulting shops. Those efforts are not classified here because this is meant to classify third-party technology vendors, not bespoke or custom solutions. AI-Enabled Agricultural Devices – Using the power of AI and ML to make agricultural devices more intelligent and more capable. Autonomous Farming – Efforts using AI and ML to create intelligent robots and equipment that can operate autonomously. Intelligent Agriculture – Solutions that leverage AI and ML to improve the overall business and capabilities of agriculture and make it more intelligent. Yield Optimization – Specific applications of AI and ML that are focused on improving the overall yield and productivity of agriculture. In this category, we profile vendors who are working within the traditional automotive industry. This doesn’t including autonomous vehicles or enabling technology for autonomous vehicles. Those are covered in lower layers of the classification chart. Instead, this category deals with AI and ML technology vendors that aim to improve existing non-intelligent vehicles or change the way that the automotive industry works. AI-Enabled Automotive Sales and Marketing – Solutions that leverage AI and ML to improve the way that autos are marketed and sold. Intelligent Car – Solutions that leverage AI and ML to help make existing vehicles more intelligent. Cognilytica profiles vendors that are helping to make people more creative, augment their creative abilities, or provide solutions that can autonomously generate creative content in a wide range of formats and media. Literary Arts – Solutions that leverage AI and ML to augment the way that humans create literary content. This category does not include general natural language generation (NLG) tools which is addressed in the AI Enabling Technologies layer. Music and Sound – AI and ML-enabled technologies that augment the way that music is created or sounds are generated, or otherwise provides intelligence to music and sound-related creative content. Applications in this category don’t include natural language processing or general audio processing capabilities, which is addressed in lower levels of the classification. Video, Images, and Design – Solutions that leverage AI and ML to generate or augment the production of video, image, or design content, focusing on the creative or augmentative role of creation. Call Center – Solutions that leverage AI and ML to improve the call center experience. Customer Experience – A wide range of vendor solutions that leverage AI and ML to improve all aspects of the customer experience from pre-engagement to post-support interaction. Customer Service – AI and ML solutions focused on improving the customer service experience. Solutions in this vendor category are focused on improving and accentuating security for the enterprise and organizations. This includes both cybersecurity as well as physical security, and aspects of fraud detection and identity verification. Adaptive Cyberthreat Management – Solutions that leverage AI and ML to provide intelligent, adaptive cybersecurity that can identify patterns and mitigate problems without explicitly pre-defined rules or malware definitions. Cybersecurity Operations – AI and ML based solutions that help manage cybersecurity operations. Fraud Detection / Identity Verification – AI and ML based solutions that help to detect and mitigate fraud and provide assistance with verifying real identities. Intelligent Cameras – Edge network cameras and support systems that provide computer vision and other AI and ML capabilities to assist with security-based use cases. Physical Security – Solutions that leverage AI and ML to enhance physical security of buildings and other secure areas. AI and ML can also help improve human’s understanding and knowledge and increase our own education. Solutions in this category are aimed at helping humans learn better and make better use of knowledge in the organization and in other locations. AI-Enhanced Knowledge Management– AI and ML based solutions that help manage the large volumes of knowledge-based content in the organization and beyond. Intelligent Learning Management – Solutions that leverage AI and ML and cognitive technologies to make management of learning systems more intelligent. Personalized Learning – Solutions that leverage AI and ML to provide personalized learning experiences to people across a wide range of use cases. The wide range of cognitive technologies are being used in traditional industries as well. This includes the use of AI and ML in energy extraction and production, utilities to deliver a wide range of energy and infrastructure resources, and the production of chemicals and other materials. Chemicals and Materials – AI and ML based solutions that provide intelligent management of the manufacture of chemicals and other materials. AI-Enhanced Electricity & Utilities – Solutions that leverage AI and ML to assist with the management and production of electricity and the management of utility infrastructure and delivery. Oil & Gas Operations– Vendors that leverage AI and ML based technologies to improve the way that oil and gas operations, discovery, and production is done. Finance has long been a leader in the use of technology to provide a wide range of products, services, and gain competitive advantage for finance-oriented firms. AI and ML have already had widespread impact in the financial services industries and it should be no surprise that there are many vendors focusing on the application of AI and ML to this industry area. Accounting & Corporate Finance – Solutions that leverage AI and ML to provide assistance for a wide range of accounting and corporate finance needs. AI-Enabled Payments – Vendors that leverage cognitive technologies to provide new forms of electronic payment. AI-Enabled Trading – Solutions that leverage AI, ML, and cognitive technologies to facilitate or autonomously execute trading transactions on different financial platforms. Intelligent Banking and Loans – Vendors that leverage AI, ML, and cognitive technologies to assist with banking operations and the process of managing loans to individuals, businesses, and organizations. Conversational Finance – Vendors that use conversational technologies (chatbots or voice assistants for example) to provide interactive intelligent services to customers. Financial Intelligence – Solutions that leverage AI, ML, and cognitive technologies to give organizations and financial institutions more visibility into the various activities, patterns, processes, and data happening that is relevant to finance. Financial Fraud Detection – Vendors that use AI, ML, and cognitive technologies to help detect and mitigate fraudulent financial behavior. Intelligent Personal Finance – Solutions that leverage AI, ML, and cognitive technologies to provide consumers with more intelligent and personalized financial guidance and assistance. Roboadvising – Vendors leveraging AI, ML, and cognitive technologies that offer autonomous or highly automated systems to provide guidance to customers on how to manage their money. AI-Enhanced xReality – Solutions that leverage AI and ML to provide greater value to augmented reality (AR), virtual reality (VR), mixed reality (MR), and other similar technologies. AI-Enhanced Dating & Relationships – Solutions that leverage AI and ML to enhance dating, relationships apps, and experiences. Game Intelligence – AI, ML, and cognitive technology solutions from vendors that provide enhancement to the gaming experience and/or game creation. Sports Intelligence & Augmentation – Solutions that leverage AI, ML, and cognitive technologies to enhance or otherwise augment the sports industries. The use of AI, ML, and cognitive technologies has wide ranging impact on the healthcare and the medical industries. For decades, technologists have been applying AI to everything from improving diagnosis, to interpreting medical images, to helping with patient care. In this rich category of vendors are nine subcategories that each have many vendors providing AI and ML-based solutions. AI-Enabled Diagnosis & Treatment – Solutions that leverage AI, ML, and cognitive technologies to provide or assist with medical diagnosis and treatments. Intelligent Digital Surgery – Vendors offering AI, ML, and cognitive technology solutions to assist with surgery, including robosurgery, telesurgery, and surgical assistance. AI-Enhanced Fitness & Wellness – Solutions that leverage AI, ML, and cognitive technologies to improve personal fitness and wellness. Intelligent Genetics – Vendors offering genetic screening and other genetics-focused solutions and services that leverage AI, ML, and cognitive technologies to deliver the primary value. Intelligent Healthcare Operations & Patient Care – Solutions that leverage AI, ML, and cognitive technologies to improve the way healthcare is delivered and managed, and provide augmented or assisted value to help with patient care and management. AI-Enabled Imaging & Diagnostics – Solutions that use AI, ML, and cognitive technologies to assist with interpreting medical imagery, provide intelligence around diagnostics and data, and otherwise help provide more insight into what’s happening to patients. Intelligent Medical Devices – Devices of a wide range of applications and types that depend on AI, ML, and cognitive technologies to provide their primary function. Personalized Care – Solutions that use AI, ML, and cognitive technologies to personalize care for individual patients and individuals. AI, ML, and cognitive technologies are finding value providing assistance in managing human resources (HR) within corporations and organizations as well assisting with job hunting and recruiting. Intelligent HR Management – Solutions that leverage AI, ML, and Cognitive Technologies to assist with HR management activities and operations. AI-Enhanced Recruiting – Vendors that use AI, ML, and cognitive technologies to assist with recruiting, staffing, job hunting, and similar activities. Cognilytica has also seen a wide range of vendors offering to improve various insurance-related activities and operations with AI, ML, and cognitive technologies. There are even a few vendors looking to revolutionize insurance itself with new AI-powered offerings that aim to change the way the insurance industry operates. AI-Powered Insurance – Insurance offerings that are primarily powered by AI, ML, and cognitive technologies that aim to change the way the insurance industry operates including AI-driven insurance companies. Intelligent Claims Handling – Solutions that leverage AI, ML, and cognitive technologies to improve the way insurance claims are handled and managed. AI-enhanced Health Insurance – Solutions that leverage AI, ML, and cognitive technologies to improve the management, operation, and provision of health insurance. AI and ML systems are proving to be very good at identifying patterns and anomalies, which is particularly helpful in the management of sometimes-connected, low compute power Internet of Things (IoT) devices and other hardware and machinery. Fleet Management – Solutions that leverage AI, ML, and cognitive technologies to manage distributed fleets of equipment, vehicles, and machinery. Intelligent IoT & Device Management – Solutions that leverage AI, ML, and cognitive technologies to manage IoT devices and other devices with limited network, compute, storage, or other edge devices. Predictive Maintenance – Vendors that use AI, ML, and cognitive technologies to provide predictive analysis and insight into the maintenance, failure, and operation of machines and other hardware devices. Not only are IT systems providing the infrastructure needed to build and manage AI solutions, but AI, ML, and cognitive technologies are being used to change and augment the way we manage our IT systems, develop applications, and manage all sorts of professional services within the enterprise. Application Development Assistants – AI, ML, and cognitive technology solutions by vendors that improve and augment the way that software applications and other IT solutions are designed, built, deployed, and managed. Intelligent IT Service Management – Solutions that leverage AI, ML, and cognitive technologies to improve the way that IT services are managed, supported, and deployed in the enterprise. AI-Enhanced Manufacturing & Product Development – Solutions that leverage AI, ML, and cognitive technologies to improve the way that products are developed and designed. Intelligent Professional Services Management – Solutions that leverage AI, ML, and cognitive technologies to improve and augment the way we manage all sorts of professional services businesses. AI, ML, and cognitive technologies are also proving to be highly valuable assistants and intelligent solutions to help improve the way that legal services are delivered. AI and ML technologies are powering more robust legal searches, improving legal service delivery, and analyzing contracts to help us understand them better. Contract Analysis – Solutions that leverage AI, ML, and cognitive technologies to help understand and provide analysis into contracts and other legal documents. Intelligent Intellectual Property Search and Management – Vendor offerings that use AI, ML, and cognitive technologies to assist with the search, management, and prosecution of intellectual property. Legal Search – Solutions that leverage AI, ML, and cognitive technologies to improve search of legal cases, documentation, evidence, and other supporting data and material. Practice Management – Vendor offerings that aim to improve legal practice management and are based on AI, ML, and cognitive technologies. Industrial robots and other forms of less-intelligent automation has long been used to improve manufacturing, increase production, and otherwise enhance the way we build and develop goods. AI, ML, and cognitive technologies aims to greatly enhance manufacturing by adding more intelligence to the whole process. Intelligent Manufacturing Automation – Solutions that leverage AI, ML, and cognitive technologies to further automate manufacturing and bring more intelligence to the manufacturing process. Manufacturing Optimization – Solutions that leverage AI, ML, and cognitive technologies to optimize manufacturing operations and processes. AI-Enhanced Quality Control – Vendor offerings that leverage AI, ML, and cognitive technologies to improve and augment quality assurance and control in manufacturing processes. Organizations are seeing significant power in leveraging AI, ML, and cognitive technologies to help generate content and process news information. Many vendors are also seeing the power and producing solutions that use cognitive technologies to change the way that content is produced and consumed. Content Personalization & Recommendation – Solutions that leverage AI, ML, and cognitive technologies to help make content more discoverable, personalized, and recommended. Content production – Vendors that use AI, ML, and cognitive technologies to produce various forms of content. Content Monitoring – Solutions that leverage AI, ML, and cognitive technologies to help control content, intellectual property, and monitor the usage of content across a wide range of channels. News Aggregation and Consumption – Vendor offerings that improve the way that news is aggregated and consumed. Just like in healthcare and medicine, AI, ML, and cognitive technologies are making a big impact on pharmaceuticals and various life sciences industries focused on research and development. Solutions in this category include AI-enhanced drug discovery and development and ML-enhanced life sciences R&D. AI-enhanced Drug Discovery & Development – Vendor offerings that depend on AI, ML, and cognitive technologies to provide intelligent solutions for drug discovery and development. AI-enabled Life Sciences Research – Solutions that leverage AI, ML, and cognitive technologies to make an impact on life sciences research & development. Vendors are also seeing value in applying AI, ML, and cognitive technologies to a wide range of real estate and property-related industries and applications. AI-enhanced Contractor & Builder Solutions – Vendor offerings that use AI, ML, and cognitive technologies to improve the building and contractor industries. Conversational Real Estate – Solutions that leverage conversational interfaces and AI-enabled technologies to engage in natural language interactions focused in real estate. Intelligent Mortgage and Loan – Vendor offerings that use AI, ML, and cognitive technologies to improve mortgage and property loan issuance, analysis, and management. Real Estate Intelligence – Solutions that leverage AI, ML, and cognitive technologies to provide visibility into real estate and property-related data and market movements. AI-enhance Real Estate Sales & Marketing – Solutions that leverage AI, ML, and cognitive technologies to augment and improve the way that real estate is sold and marketed. AI is further helping to revolutionize the way we buy and sell goods. Many of the leading e-commerce companies are also leading AI companies, using the power of big data from customer profiles and purchase interactions to feed into a cycle of making their systems even more intelligent and competitive. If you can’t beat these technology behemoths, join them with AI-powered retail and e-commerce solutions from the growing number of vendors providing them. AI-Enabled Commerce – Solutions that leverage AI, ML, and cognitive technologies to change the way online commerce is done. Autonomous Retail – Solutions that leverage the wide array of cognitive technologies to enable completely self-service retail experiences. Conversational Commerce – Vendors offering commerce technologies that use a conversational mode of interaction and natural language for commerce transactions. Inventory & Pricing Optimization – Solutions that leverage AI, ML, and cognitive technologies to assist with inventory management and find the optimal price for goods. Intelligent Product Management – Vendors offering AI, ML, and cognitive technology solutions that help manage the various products placed online for sale. AI-Enabled Recommendation & Personalization – Solutions that leverage AI, ML, and cognitive technologies to make recommendations and provide personalized offers. Intelligent Travel & Hospitality – Vendors utilizing AI, ML, and cognitive technologies to change the way that the travel and hospitality industries sell and promote their offerings. Perhaps surprisingly, one of the biggest categories in all of Cognilytica’s AI Vendor classification, in terms of the number of vendors, is sales and marketing. There are more vendors in the sales and marketing category than any other category that Cognilytica has profiled. Perhaps this is a sign of just how much AI, ML, and cognitive technologies are impacting this domain. Intelligent Advertising Optimization – Solutions that leverage AI, ML, and cognitive technologies to improve, optimize, enhance, and augment the way that advertising is purchased, placed, created, and otherwise utilized. AI-Enabled Content Optimization – Vendors that offer technology solutions leveraging AI, ML, and cognitive technologies that optimize content for purposes of sales and marketing and content-driven marketing campaigns. AI-Enabled Customer Retention – AI, ML, and cognitive technology solutions focused on identifying current customers who might be at danger of ending a customer relationship or otherwise “churning out”, and providing solutions to retain those customers. Customer Intelligence – The full name of this subcategory is actually leads, prospect, and customer intelligence, which indicates that it is a category of AI, ML, and cognitive vendor solutions aimed to help companies identify prospective customers, create customer profiles, and identify lead and prospect pools from a wide range of sources, or develop and enhance profiles of existing customers so that they can be better served and up-sold to additional products and services. Marketing Automation & Intelligence – Solutions that leverage AI, ML, and cognitive technologies to help automate marketing, facilitate better usage of marketing channels, augment existing marketing campaigns, optimize marketing processes, and gain more intelligence in the market to improve overall sales and conversions. Reputation Management – Solutions that leverage AI, ML, and cognitive technologies to monitor online reviews and comments about a company and its offerings to help mitigate or otherwise address negative reviews and enhance positive ones. Intelligent Sales Enablement – Vendor offerings that use AI, ML, and cognitive technologies to improve sales activities, enhance customer relationship management (CRM) systems, augment sales operations, and generally help to add more intelligence to the sales process. AI is making a broad impact on the way that organizations procure materials and deliver products to their customers. While much has been said about drones and autonomous vehicles delivering products to customers, behind the scenes, AI and ML have been making a greater impact on warehousing and logistics, providing predictive analytics to help improve delivery times, and make the vision of just-in-time inventory a reality. AI-Enhanced Delivery and Fulfillment – Solutions that leverage AI, ML, and cognitive technologies to enhance and optimize the delivery of goods to customers and organizations and improve the efficiency of fulfillment. Intelligent Logistics Optimization – Vendors that offer AI, ML, and cognitive technology solutions to improve logistics and warehouse operations. Intelligent Supply Chain Optimization – Solutions that leverage AI, ML, and cognitive technologies to improve the overall efficiency and optimization of corporate supply chains. If it seems that this classification and categorization is exhaustive and exhausting, it is! This is by far the most comprehensive, detailed, and robust evaluation of the AI vendor landscape out there. But the classification is only a starting point. 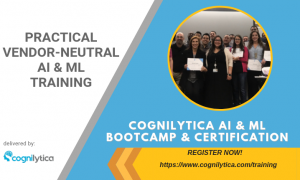 Cognilytica is using this classification as a way of organizing the vendors so that we can perform deep analysis and research into the various markets for these AI offerings. In our next post, we’ll share our research schedule for 2019 and which of the above classification market segments will be included in each report. Now that our classification should have taken away the confusion over the market, it’s time to begin digging deep to provide some real understanding! Make sure to follow along, and sign up to be a research and advisory customer if you’re not one already!